The arbor on our farm as the roses begin to grow in. In a few years they will completely fill it up. When I put my first climbing roses an an arbor I noticed after a few years it had lots of blooms across the top but very little up the side. 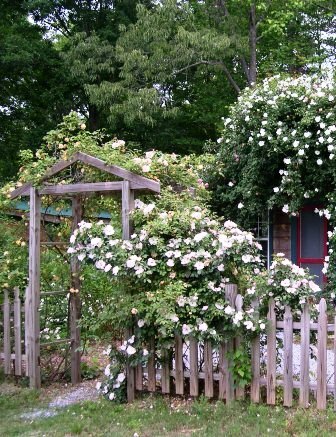 In trying to figure out a solution to this problem, I came across the idea of layering roses up the arbor. The idea was to have different roses bloom at different heights. Today the arbor in my garden has as many as 6 different roses on it and when they are all in bloom it’s a sight to behold. And it’s easy to do. Even climbing roses come in different heights and you will use that to your advantage. Use tall roses to cover the top, medium climbing roses for for the sides and shrub roses with long canes for the lower part. As to colors and bloom shapes that’s up to you. After all, it’s your garden! Select roses that grow to different sizes to cover different parts of the arbor. Tall climbers for the top. Small to medium climbers for the top of the sides. Taller shrub roses for the lower parts of the sides. Train the taller climbers straight up until you get to the top. Then lay them across the top. Train the medium climbers straight up until you get halfway up the sides. Then start winding them back and forth. Start winding the canes of the shrubs back and forth right away. Plant the roses in the same trench at the base of the arbor and don’t worry about spacing and having air circulation. These are Garden Roses and they are disease resistant by nature! Here is a video that shows you what I mean.